© 2019 The Korean Vacuum Society. Received January 21, 2019; Revised March 22, 2019; Accepted March 27, 2019. 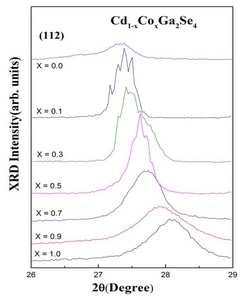 The structural and optical properties of Cd1-xCoxGa2Se4 mixed crystals were investigated in the range 0.0 ≤ x ≤ 1.0 by measuring the X-ray diffraction and optical absorption. The X-ray diffraction analysis demonstrated that Cd1-xCoxGa2Se4 crystalized into a tetragonal structure for 0.0 ≤ x ≤ 1.0. The tetragonal lattice constants were a = 5.744 Å and c = 10.784 Å for CdGa2Se4 (x = 0.0), and a = 5.611 Å and c = 10.913 Å for CoGa2Se4 (x = 1.0), which are the end members of the Cd1-xCoxGa2Se4 system, exhibiting a composition dependence that varied linearly with composition x. 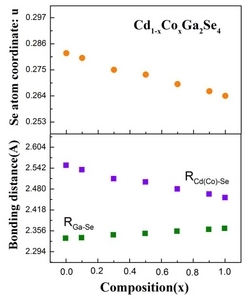 The tetragonal structural properties of Cd1-xCoxGa2Se4 were investigated by taking into account the compositional dependence of the tetragonal distortion, 2-(c/a), and bonding distances RCd(Co)-Se and RGa-Se. 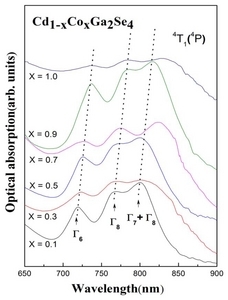 The optical absorption spectra exhibited triplet absorption bands in the range 650 – 900 nm corresponding to the 4A2(4F) → 4 T1(4P) transition of the Co2+ ions with Td symmetry sites, and a broad band in the range 1100 – 2200 nm corresponding to the 4A2(4F) → 4T1(4F) transition, for all investigated compositions. The composition dependencies of the crystal-field parameter, Dq, and Racah parameter, B, are discussed on the basis of a tetrahedral crystal-field approximation and composition dependent tetragonal structure. 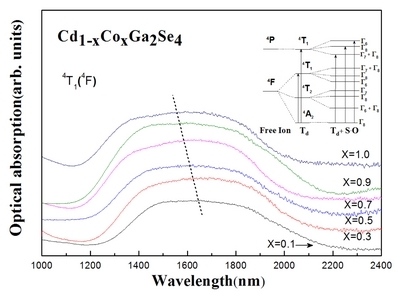 CdGa2Se4, is one of the AIIB2IIIC4VI (A = Cd, Zn, Hg, B = Ga, In, Al, C = S, Se, and Te)-type ternary semiconductors, and has become a subject of interest as a material with potential applications in optoelectronics owing to its high photosensitivity and strong luminescence in the visible region . Many studies have been performed on the optical characterizations of CdGa2Se4, namely optical absorption , photoconductivity [3,4], photoluminescence , and Raman scattering [6,7]. 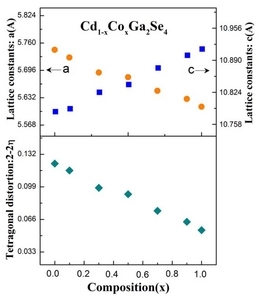 The doping effects of cobalt metals as impurities in CdGa2Se4 have also been studied [4,8]. To increase the applicability of CdGa2Se4, a method of controlling its fundamental properties by doping impurities is required. 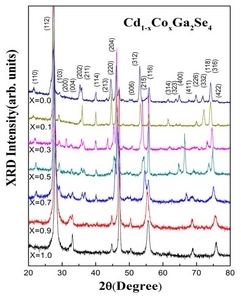 In previous works [9,10], we studied the structural and optical properties for 0.0 ≤ x ≤ 0.5 in Cd1-xCoxGa2Se4 mixed crystals, which were replaced by Co instead of Cd in the CdGa2Se4. These lead to an increase in the applicability of CdGa2Se4 through tuning the energy gap and lattice constants by varying the Co content. However, the Cd1-xCox-Ga2Se4 system has not been studied over the full range of 0.0 ≤ x ≤ 1.0 owing to the difficulty of crystal growth near x = 1.0. In this paper, we investigate the composition-dependent behavior of the structural and optical properties for the full range, 0.0 ≤ x ≤ 1.0, in Cd1-xCoxGa2Se4 mixed crystals grown by the directional melt technique. The structural properties, such as the lattice constants, tetragonal distortion, and atomic coordinates, are investigated as a function of x in the range 0.0 ≤ x ≤ 1.0. The optical absorption spectra for 300 – 2400 nm are analyzed in the framework of the crystal-field theory. The variations of the crystal-field and Racah parameters, Dq and B, respectively, with x in the Cd1-xCoxGa2Se4 system are also discussed. The Cd1-xCoxGa2Se4 mixed crystals were prepared in the range 0.0 ≤ x ≤ 1.0 using the directional melt technique described in Ref. . However, for the crystals with x ≥ 0.5, the temperature of the horizontal furnace was maintained at 1200 °C for approximately 12 days. To achieve homogeneous crystals, the furnace was also rotated at a speed of 4 rpm during the growth procedure. The composition of the grown crystals was determined by means of inductively coupled plasma mass spectroscopy (JY 38 PLUS, France). The crystals within the error limits of 3 % from their start compositions were used in the measurements. The analysis of the crystal structure was performed using an X-ray diffractometer (Rigaku DMAX 2000, Japan). The optical absorption spectra were measured in the range 300–2400 nm at 300 K using a UV-VIS-NIR spectrophotometer (Hitachi U-3501, Japan) equipped with a 60-mm integrating sphere. Figure 1 shows the X-ray diffraction (XRD) pattern spectra for the Cd1-xCoxGa2Se4 crystals. The compound CdGa2Se4, which corresponds to the end member (x = 0.0) of the Cd1-xCoxGa2Se4 system, is known to have a tetragonal structure . The XRD spectrum, for the case x = 0.0 in Fig. 1, shows a typical tetragonal structure. For the other compositions, the XRD patterns are similar to that of the x = 0.0 case, without extra peaks related to the individual elements or binary alloy. The dominant (112) diffraction peak of the tetragonal structure exhibits a composition dependence that shifts toward higher 2θ angles with increasing x, as shown in Fig. 2. The results are summarized in Table I, and are plotted in Fig. 4 as a function of x. In Fig. 4, the Se atom coordinate u varies from 0.282 (x = 0.0) to 0.264 (x = 1.0) with increasing x, approaching the value of a cubic zinc-blende structure (0.25) . On the other hand, decreasing RCd(Co)-Se and increasing RGa-Se leads to a smaller difference in the bonding distance between each the cations with the Se atom for increasing x. This is in accordance with our results for the composition dependent-tetragonal distortion of the Cd1-xCoxGa2Se4 system. where b = [(10Dq-9B)2 + 144B2]1/2. The obtained parameters are also given in Table II. The Dq-values range from 333 to 357 cm−1, which are in agreement with Dq ≈ 400 cm−1 for tetrahedral Co2+ ions, compared with Dq ≈ 900 cm−1 for octahedral Co2+ ions, Dq ≈ 700 cm−1 for tetrahedral Co3+ ions, and Dq ≈ 1600 cm−1 for octahedral Co3+ ions . This implies that the Co atoms in Cd1-xCoxGa2Se4 occupy the tetrahedral sites of the host lattice as Co2+ ions. The Dq and B values are plotted in Fig. 8 as a function of the composition x. The composition dependence of Dq increases from 333 to 357 cm−1, whereas that of B decreases from 614 to 567 cm−1, with increasing x. A similar behavior for the variation of Dq and B was also observed in a pressure study of CdTe:Co . The study provided the pressure dependence of Dq and B, i.e., Dq increases and B decreases, with increasing pressure. It was shown that the pressure-induced shifts of Dq and B are connected with changes of the interatomic distance and iconicity of the CdTe. These are in a good agreement with our results of the composition dependent properties of the interatomic distance between a cobalt-metal atom and its ligands, i.e., RCd(Co)-Se, decreases with the increasing Co composition x (see Fig. 4). In this work, the structural and optical properties of Cd1-xCoxGa2Se4 mixed crystals grown by the directional melt technique were investigated in the range 0.0 ≤ x ≤ 1.0. 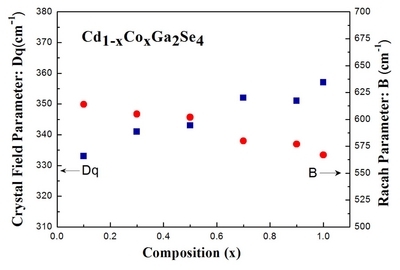 The XRD analysis demonstrated that Cd1-xCoxGa2Se4 crystalized into a tetragonal structure for 0.0 ≤ x ≤ 1.0 and formed a solid solution between CdGa2Se4 (x = 0.0) and CoGa2Se4 (x = 1.0). The tetragonal lattice constants exhibited a composition dependence that varied linearly with the composition x. The composition-dependent properties of the tetragonal distortion, 2–(c/a), were investigated by introducing the electronegativity of the constituent atoms, and by considering the composition dependence of RCd(Co)-Se and RGa-Se, and the nearest-neighbor bonding distances between the cations atoms and the Se atom. The composition-dependent optical transitions of 4A2(4F) → 4T1(4P) and 4A2(4F) → 4T1(4F) of the tetrahedral Co2+ ions were analyzed on the basis of a tetrahedral crystal-field approximation, providing the crystal-field and Racah parameters, Dq and B, respectively. The composition dependences of the parameters Dq and B were explained based on the composition dependent-tetragonal structure. It was shown that the Dq and B depend strongly on the variations of the tetragonal structure with composition x. This research was supported by the Research Funds of Mokpo National University in 2017. Fig. 1. (Color online) X-ray diffraction patterns of the Cd1-x CoxGa2Se4 (0.0 ≤ x ≤ 1.0) crystal powders. Fig. 2. (Color online) Composition dependence of the (112) plane in the X-ray diffraction patterns of the Cd1-x CoxGa2Se4 (0.0 ≤ x ≤ 1.0) crystal powders. Fig. 3. (Color online) Composition dependence of the lattice constants and tetragonal distortion for the Cd1-x CoxGa2Se4 (0.0 ≤ x ≤ 1.0) crystals. Fig. 4. (Color online) Composition dependence of the Se atom coordinate and bonding distance RCd(Co)-Se, RGa-Se, for the Cd1-xCoxGa2Se4 (0.0 ≤ x ≤ 1.0) crystals. Fig. 5. (Color online) Optical absorption spectra of the Cd1-x CoxGa2Se4 (0.0 ≤ x ≤ 1.0) crystals at 300 K.
Fig. 6. (Color online) Composition dependence of the optical absorption bands corresponding to the 4A2(4F) → 4T1(4P) of the tetrahedral Co2+ ions in the Cd1-x CoxGa2Se4 (0.0 ≤ x ≤ 1.0) crystals. Fig. 7. 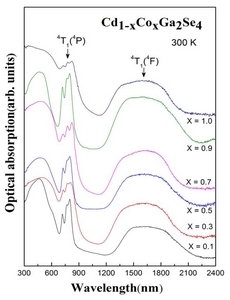 (Color online) Composition dependence of the optical absorption band corresponding to the 4A2(4F) → 4T1(4F) of the tetrahedral Co2+ ions in the Cd1-x CoxGa2Se4 (0.0 ≤ x ≤ 1.0) crystals. Fig. 8. (Color online) Composition dependence of the parameters Dq ( ) and B ( ) in the Cd1-xCoxGa2Se4 (0.0 ≤ x ≤ 1.0) crystals. Various values of the lattice constants, tetragonal distortion, and atomic coordinate for the Cd1-x CoxGa2Se4 (0.0 ≤ x ≤ 1.0) crystals. Values of the observed absorption band energies, crystal-field parameter Dq, and Racah parameter B for the Cd1-xCoxGa2Se4 (0.0 ≤ x ≤ 1.0) crystals. AN. Georgobiani, SI. Radautsan, and IM. Tiginyanu, Sov Phys Semicond. 19, 121 (1985). ST. Kshirsagar, and APB. Sinha, J Mater Sci. 12, 2441 (1977). JA. Beun, R. Nitsche, and M. Lichtensteiger, Physica. 27, 448 (1961). CD. Kim, TS. Cho, JK. Kim, WT. Kim, and HN. Kim, J Appl Phys. 63, 5469 (1988). CD. Kim, HM. Jeong, HG. Kim, and WT. Kim, J Korean Phys Soc. 27, 440 (1994). A. Parisini, and PP. Lottici, Phys Stat Sol(b). 129, 539 (1985). HL. Park, HK. Kim, CH. Chung, CD. Kim, TS. Cho, and WT. Kim, Phys Stat Sol(b). 148, K173 (1988). CD. Kim, TS. Cho, JK. Kim, and WT. Kim, Phys Rev B. 36, 9283 (1987). HW. Park, YJ. Jung, CD. Kim, and MS. Jin, New Phys: Sae Mulli. 65, 949 (2015). CD. Kim, YJ. Jung, and MS. Jin, New Phys: Sae Mulli. 66, 1348 (2016). L. Vegard, Z Phys. 5, 17 (1921). D. Wearie, and J. Noolandi, J Phys. 36, C3 (1975). JE. Jaffe, and A. Zunger, Phys Rev B. 29, 1882 (1984). S. Sugano, Y. Tanabe, and H. Kamimura. Multiplets of Transition-metals Ions in Crystals (Academic Press, New York, 1970). DL. Wood, and JP. Remeika, J Chem Phys. 46, 3595 (1967). J. Gardavsky, A. Werner, and HD. Hochheimer, Phys Rev B. 24, 4972 (1981). Copyright © The Korean Vacuum Society. All Rights Reserved.